Even though it’s not quite warm yet, maybe you’ve begun to look forward to lighter and brighter flavors of spring. After a long, cold winter, that’s not a surprise! Now that we’re a week away from the Equinox (March 21), we look forward to dishes and flavors of spring. Italian cuisine is seasonal in its flavors, with many bright items in springtime. Say good-bye to heavy dishes such as stews and root vegetables. In springtime, Italian cuisine becomes more focused on vegetables, which appear in bounty around the country during the warmer months. 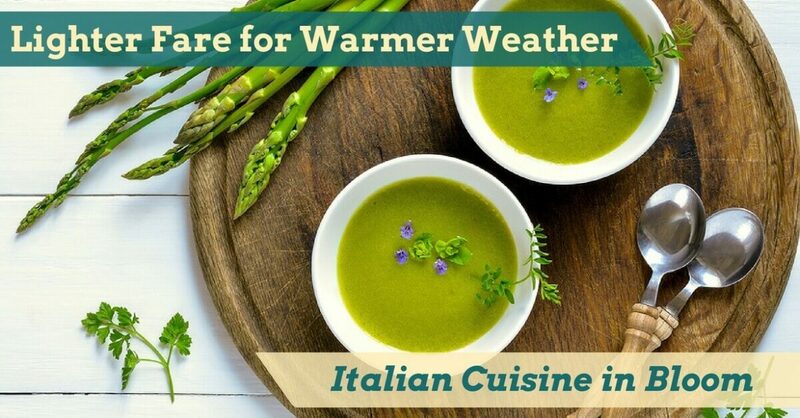 Springtime Italian cuisine features items such as fava beans, asparagus, artichokes, zucchini, spring peas, leek, beets, beans, garlic, lemon, and fresh fruit (strawberries, cherries, etc.). You’ll find these more delicate vegetables – asparagus, zucchini and zucchini flowers, and spring peas – in many Italian dishes. Fresh spring fruits will make their way into desserts. March is a transitional month in the Mediterranean climate, with the first half still quite cold and the second half thawing into a spring warmth. Across Italy, the regional cuisines reflect the meteorological changes. In regions such as Puglia and Tuscany, farmers begin to plant items for late spring and summer. Around the country, you may find beets and asparagus, and quite often, leek. Moving into April, artichokes become more popular, appearing in many different dishes countrywide. Artichokes may pop up in soup or risotto dishes. Come May, you’ll find fava beans a popular addition to dishes, especially after the May 1st holiday. Fave e pecorino is the traditional dish for Italy’s May Day feast. Asparagus is often harvested later in spring, during May, and will be served often in dishes that feature fava beans, pecorino cheese, and egg. St. Joseph’s Feast occurs during Lent and is a traditional day of abstinence. St. Joseph is the patron saint of Sicily, and as a result there is a feast and celebration in that region – as well as other parts of Italy. According to religious legend, there was a famine in Sicily in the Middle Ages. Residents of Sicily prayed to St. Joseph, their patron saint, promising him a great feast in his honor if he answered their prayers. Legend has it that the rain did come, and as a result, so began the great St. Joseph’s Day Feast in Sicily! For this feast, the fava bean is a central ingredient. This is because the fava bean was the main cropped that saved Sicilians from starvation after this historic drought. Many communities create a Sicilian dish known as maccu di San Giuseppe – a soup made of fava beans, fennel seeds, olive oil, salt, and pepper. It is a very simple soup made by peasants dating back to ancient times. Because St. Joseph’s Day coincides with Lent, meat is not served during the celebration. Additionally, many foods will feature breadcrumbs to symbolize “dust,” honoring St. Joseph’s profession in carpentry. Looking at the week ahead, weather is perfectly spring-like here in Salt Lake City! With warmer days and chilly nights, we’ve got a menu here at Cucina Toscana that will work during this transition period. You’ll find Italian spring staples peppering our menu, with flavors of lemon, asparagus, and artichoke. To begin, we are pleased to offer zuppa di asparagi, a soup of asparagus, zucchini, and truffle oil – a perfect transition piece from winter to spring, as truffle is often featured in cold-weather Italian cuisine, while asparagus and zucchini hints at the brightness of spring. Another springtime favorite is beets, which you’ll enjoy in our barbabietole insalata, a salad of roasted purple and golden beets, topped with goat cheese and balsamic dressing – a combination of bright roasted flavors highlighted with the soft acidity of balsamic vinegar. Check out our piccata di pollo al limone – chicken breasts served with capers, artichokes, mushrooms, lemon, and wine. Or perhaps on a cooler night, you may be interested in our anatra in porcetta – duck breast with rosemary and fennel, and roasted figs. This dish captures the beginning flavors of spring in the fennel, while still warming you up with the hearty duck breast and roasted fig. For a lighter option, try our salmone carpaccio – which combines fennel and lemon with smoked salmon. Here at Cucina Toscana, we look forward to serving you all year round. We’re excited to share our spring cuisine with you. (801) 328-3463 | COME DINE WITH US!